One of the most important openings in the path to the modern computer was made by the British mathematician Alan Turing—remarkably, while he was solving an entirely different problem. Shy and insecure about his middle-class origins, considered eccentric by those who did not know him well, Turing could show those close to him sly humor and bracing candor—even about his homosexuality. He also had one of the keenest minds of the twentieth century. Turing's famous 1936 doctoral dissertation tackled one of the great mathematical challenges of all time, the “decidability problem,” by proposing an imaginary programmable calculating machine. The idea of actually producing such a “Turing machine” did not crystallize until Turing and his brilliant Bletchley Park colleagues built devices to crack the Nazis’ Enigma code. Along the way, Turing crossed paths with some of the greatest minds of his time, including John von Neumann and Ludwig Wittgenstein. After the war, Turing became a champion of artificial intelligence, formulating the famous Turing test that challenges our ideas of human consciousness. But Turing’s postwar computer-building was cut short when he was arrested for violating antihomosexuality laws and sentenced to a “treatment” that amounted to chemical castration. 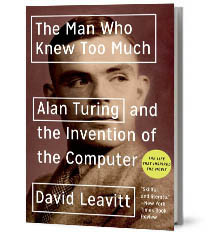 The Man Who Knew Too Much explains Turing’s work and explores the connections between his genius and his short, brave life. It is published by W. W. Norton. *Errors in the original hardback edition were corrected for the paperback and e-book. I talk about the Turing Problem with James Gleick and Janna Levin on NPR’s RadioLab. I talk about Alan Turing’s centenary with Ira Flatow on NPR’s Science Friday. Codebreaker, the Channel 4 documentary about Alan Turing in which I am featured, is now being screened across the United States.